Permaculture is a conscious design system, which mixes indigenous and traditional wisdom with modern progressive education and technology, following the patterns and principles of natural systems. The word permaculture itself originally came from a blend of the words 'permanent' and 'agriculture', but as permaculture design has progressed and developed over the years from being a predominantly land based application to one that has been applied to personal, social and cultural projects, it has come to be more accepted as a blend of the words 'permanent' and 'culture'. Imagine if we as a species were living our lives as if we were here for the long term - a permanent culture. Would we still be diminishing our finite natural resources and polluting the Earth systems we rely on to survive as we are now? Or would we be striving to find a better way to do things? Permaculture is about finding that better way. You can read more about the history and evolution of permaculture design here. Everything in permaculture revolves around a set of ethics and principles. (Shared from the work of permaculture co-founder David Holmgren). Rebuild natural capital. The Earth is a living, breathing entity. Without ongoing care and nurturing there will be consequences too big to ignore. 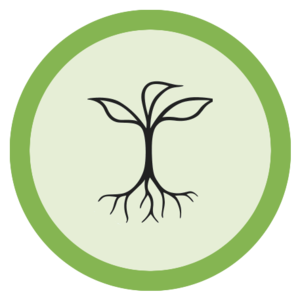 The icon of the young plant represents organic growth, a key ingredient in sustaining life on Earth. Earth Care can be taken to mean caring for the living soil. The state of the soil is often the best measure for the health and well-being of society. There are many different techniques for looking after soil, but the easiest method to tell if soil is healthy is to see how much life exists there. Our forests and rivers are the lungs and veins of our planet, that help the Earth live and breathe, supporting many diverse life forms. All life forms have their own intrinsic value, and need to be respected for the functions that they perform – even if we don’t see them as useful to our needs. By reducing our consumption of ‘stuff’, we reduce our impact on the environment, which is the best way to care for all living things. Look after self, kin and community. If people’s needs are met in compassionate and simple ways, the environment surrounding them will prosper. The icon of the two people together, represents the need for companionship and collaborative efforts to affect change. People Care begins with ourselves and expands to include our families, neighbours and wider communities. The challenge is to grow through self-reliance and personal responsibility. Self-reliance becomes more feasible when we focus on non-material well-being, taking care of ourselves and others without producing or consuming unnecessary material resources. By accepting personal responsibility for our situation as far as possible, rather than blaming others, we empower ourselves. If we can recognise that a greater wisdom lies within a group of people, we can work with others to bring about the best outcomes for all involved. The permaculture approach is to focus on the positives, the opportunities that exist rather than the obstacles, even in the most desperate situations. Set limits and redistribute surplus. We are provided with times of abundance which enables us to share with others. The icon of the pie and a slice of it represents the taking of what we need and sharing what we don’t whilst recognising that there are limits to how much we can give and how much we can take. Established fruiting trees are likely to produce more than one person can eat. It takes time to pick and preserve the harvest, and there are limits to how much fruit we can use. There are many ways that we benefit from giving a fair share of the bounty to others in our community. The growth in human consumption and the accelerating extinction of species make clear the impossibility of continuous growth. Sometimes we need to make hard decisions and consider what enough is. We need to focus on what is appropriate for us to do, rather than what others should do. By finding the right balance in our own lives we provide positive examples for others, so that they can find their own balance. Below is an illustration showing the principles of permaculture. These inspire and support our design journey by giving us a framework in which to see our ideas through. You can read more details about each of the principles here. By using a combination of these ethics, principles and a wide range of permaculture design methods and tools, our design work can begin. Over the past few years I have come to understand how permaculture design can be applied to anything under the sun, from tiny balconies to huge landscapes, spiritual development to relationships, business plans to community structures, house plans to finding your life purpose. All with balanced, thoughtful, holistically beneficial, progressive and inspiring results. Through the exploration into finding new and better ways to live as a modern culture upon our degrading planet, permaculture can lead us into a whole world of incredible topics - natural building, alternative technologies, regenerative farming, non violent communication, holistic management and so much more. Permaculture is very much a grassroots movement, as an ever growing number of people come to it from all walks of life and all over the world, as it's benefits can be felt in every type of environment. (See Geoff Lawtons 'Greening the Desert' video for an inspiring example of this). Through practicing permaculture design we can take the control back from the corporations and governments (who are doing so little to protect our ecosystems, environment and future) and co-create a world that works for all of us, planet and polar bears included.